Whiteness HP Blue is a product that gathers the technology of the best bleaching dental systems and the new worldwide dentistry tendencies towards conservative and safety techniques for in-office bleaching procedures. 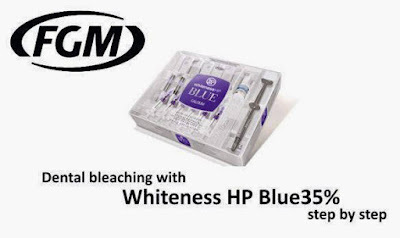 Whiteness HP Blue is a 20 or 35% hydrogen peroxide gel. Its formulation is based on the precursor Whiteness HP Maxx bleaching system; however changes in the mode of application and in the composition were introduced in order to increase the efficacy of the new material even under low hydrogen peroxide concentration. ► See also: Can you successfully bleach striated tetracycline stains?